Valentine's Day is great opportunity to show appreciation for the people we love. Even when we're young, this day revolves around heart shaped candies and glittery notes covered with stickers passed from desk to desk. This is a guide for parents to help their children express their love and friendship on this special day. Food: Surprise your child with valentine food art! If there's one thing they love more than food, it's playing with it. Click the links below to direct you to a variety of Valentine's Day treats that perfect for the heart shaped holiday (healthy too!). And many more… follow the arrows on the site to continue your search. Arts & Crafts: The links below will direct you to a handful of Valentine inspired craft ideas for kids. Whether you plan an after school activity or organize and incorporate this hands-on art into your class lesson (for teachers), they will be fully entertained. Step by step instructions and material list included in the link. Perfect for carrying and delivering your valentines! Pretty pink keepsake with note inside—great gift for Grandma! Silly lollipops in the shape of mustaches and puckered lips—sure to make the kids giggle. v In the Middle Ages, young men and women drew names from a bowl to see who would be their Valentine. They would wear this name pinned onto their sleeves for one week for everyone to see. This was the origin of the expression "to wear your heart on your sleeve." v 15% of U.S. women send themselves flowers on Valentine's Day. 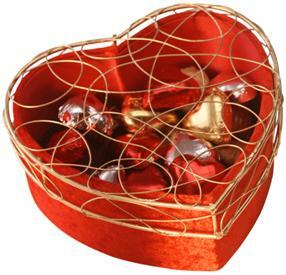 v More than 35 million heart-shaped boxes of chocolate will be sold for Valentine's Day. v 189 million stems of roses are sold in the U.S. on Valentine's Day. v Approximately one billion Valentines are sent out worldwide each year according to estimates by the U.S. Greeting Card Association. That's second only to Christmas. v Every Valentine's Day, the Italian city of Verona, where Shakespeare's lovers Romeo and Juliet lived, receives about 1,000 letters addressed to Juliet.